Scientists have rendered objects invisible under near-infrared light. Unlike previous such "cloaks", the new work does not employ metals, which introduce losses of light and result in imperfect cloaking. Because the approach can be scaled down further in size, researchers say this is a major step towards a cloak that would work for visible light. 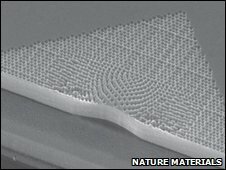 One of the research teams describes its miniature "carpet cloak" in the journal Nature Materials. This "carpet" design was based on a theory first described by John Pendry, from Imperial College London, in 2008. Michal Lipson and her team at Cornell University demonstrated a cloak based on the concept. Xiang Zhang, professor of mechanical engineering at the University of California, Berkeley, led the other team. "Essentially, we are transforming a straight line of light into a curved line around the cloak, so you don't perceive any change in its pathway," he explained. This is not the first time an invisibility cloak has been made, but previous designs have used metals, whereas the carpet cloak is built using a dielectric - or insulating material - which absorbs far less light. "Metals introduce a lot of loss, or reduce the light intensity," said Professor Zhang. This loss can leave a darkened spot in the place of the cloaked object. So using silicon, a material that absorbs very infrared little light, is a "big step forward," he says. The cloak's design cancels out the distortion produced by the bulge of the object underneath, bending light around it - like water around a rock - and giving the illusion of a flattened surface. Professor Zhang explained that the cloak "changes the local density" of the object it is covering. "When light passes from air into water it will be bent, because the optical density, or [refractive] index, of the water is different to air," he told BBC News. "So by manipulating the optical density of an object, you can transform the light path from a straight line to to any path you want." The new material does this via a series of minuscule holes - which are strategically "drilled" into a sheet of silicon. Proving Professor Pendry's theory, Professor Zhang's team was able to "decide the profile" of the cloaked object - altering the optical density with the holes. "In some areas we drill lots of very densely packed holes, and in others they are much sparser. Where the holes are more dense, there is more air than silicon, so the optical density of the object is reduced," Professor Zhang explained. "Each hole is much smaller than the wavelength of the light. So optical light doesn't see a hole - it just sees a sort of air-silicon mixture. So as far as the light is concerned, we have adjusted the density of the object." He pointed out that his demonstration cloak is very tiny - just a few thousandths of a millimetre across. But there are applications even for a cloak of this size. Such a device could be used, for example, in the electronics industry, to hide flaws on the intricate stencils or 'masks' that are used to cast processor chips. "This could save the industry millions of dollars," he said. "It would allow them to fix flaws rather than produce an entirely new mask."